Fried snapper, peas & rice, potato salad and mac & cheese. One of our objectives for this course is to identify ways in which the local Bahamians can make small healthy changes which minimize the impact on the their culture. One of the areas we are evaluating is their diet. 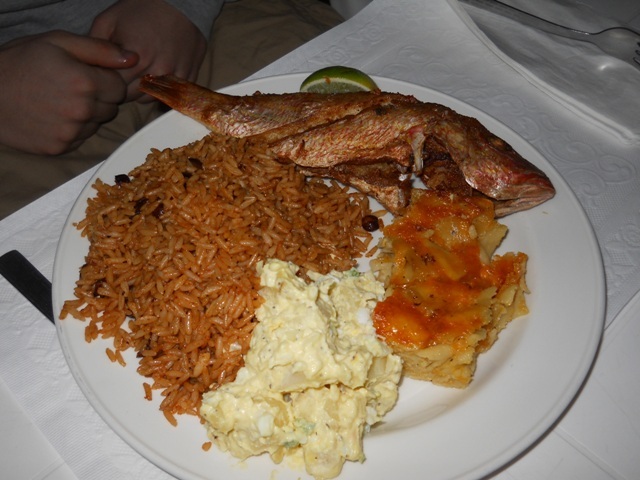 This is not an easy task as many of the restraunts that serve “typical” Bahamian food are really serving show case dishes that are not necessarily what is consumed in the homes on a daily basis. The food in the restruants more often mimicks the Sunday meals (post church). The purpose of this blog page is to examine the foods that are consumed by the locals of S.Eluethera.